The 45 Long Colt (45LC) or 45 Colt has been a favorite of Cowboys, the US Army in the late 1800’s, and settlers in the Old West since 1872. It is one of the more powerful revolver cartridges on the market today and has continued to hold on to its popularity due to its use in hunting medium to large game, and Cowboy Action Shooting events. 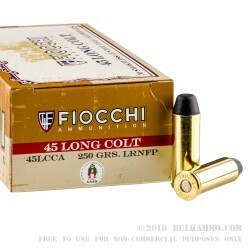 These Fiocchi 45 Long Colt Cowboy loads are perfect for Cowboy Action Shooting due to their lighter recoil and reliability. 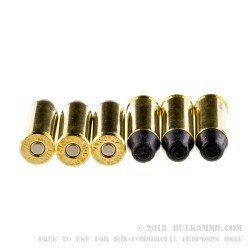 They are loaded with a 250 grain LRNFP or Lead Round Nose Flat Point bullet, and utilize a reloadable, high polished, Boxer primed thick walled brass case. They have a documented muzzle energy of 312-foot pounds, and 750 feet per second muzzle velocity. The bottom of each case is stamped with “45 Colt” and “C.F.L.” which stands for Center Fire Load. 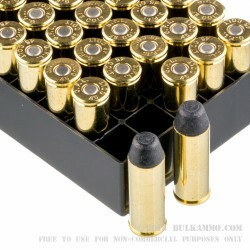 These come packed up tight in the Fiocchi Cowboy Action load box, with 50 rounds in each, and a SASS logo on each box. Perfect for your next day at the range, or to function test any lever action rifle, these 45 Long Colt rounds will accompany you to your next Cowboy Action sporting showdown! Good ammo, a little "hot"
All in all I am very satisfied with this ammo. My Taurus Judge works great with these loads. 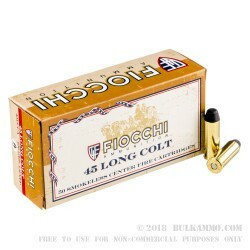 The .45 Long-Colt Ammo by Fiocchi has worked flawlessly for me and I'll keep ordering them from BULK AMMO. I also like their fast delivery. Q: Do you know if there is a maximum load limit for a stainless Ruger Vaquero single action pistol? A: The Ruger Vaquero is well known for being a tough and durable firearm, capable of handling loads that are more powerful than standard .45 Colt ammunition. To determine what your exact weapon would be capable of, it would be best to contact Ruger and give them the serial number, then ask about pressure limitations. Also, make sure that it is not a New Vaquero, as the two are capable of handling different loads. In addition, there might have been manufacturing changes over the years that increased the strength of the weapon. In any case, this Fiocchi .45 Colt ammunition is not loaded to higher pressures and is safe to fire in any modern production revolver that is marked by the manufacturer as being intended to fire .45 Colt.